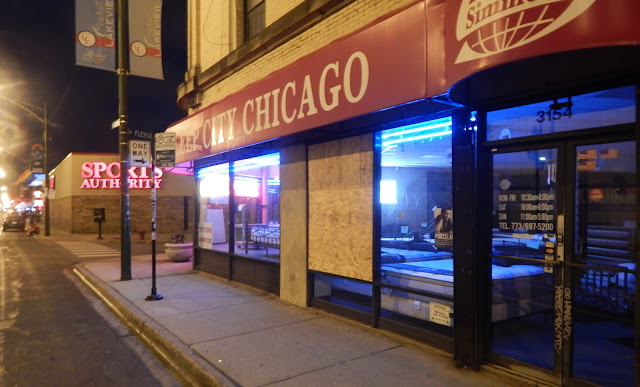 Only one storefront window was broken in the overnight Stanley Cup victory party on the streets of our neighborhood—at a mattress store, of all things. But at least two—and possibly more—persons were robbed in the area, including one who was mugged at Sheffield and Oakdale, steps from the scene of a murder that stemmed from a cell phone robbery late last month. That is the second robbery near the murder scene in two days. And, while storefront windows escaped largely unscathed, the windows of police vehicles were not so lucky. 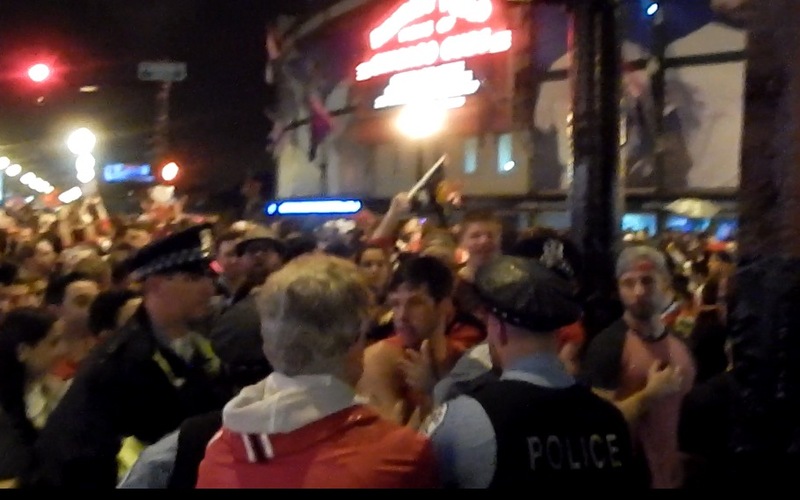 Eight police units were intentionally damaged during the after party, mostly on Addison and Eddy west of Clark Street. 7:51PM — Ka-Ching! Vice unit issues the first license violation of the night. 3300 block of Clark. 8:11PM — Ka-Ching! Ka-Ching! Ka-Ching! Vice unit cites another bar. 3400 block of Clark. 9:01PM — Dude. The game ain’t even over. EMS arrives for a man too drunk to walk. 3464 Clark. 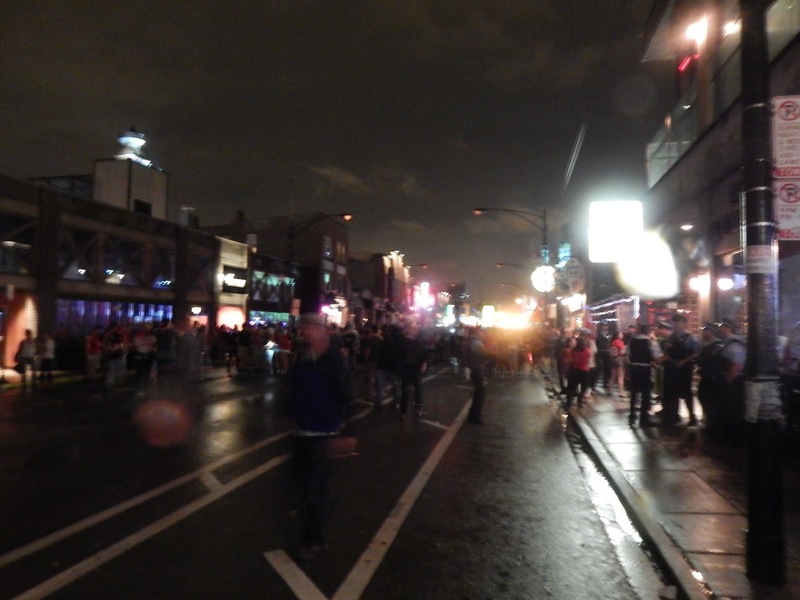 9:48PM — Order: No more civilians are to enter Clark Street between Addison and Newport. 9:53PM — HAWKS WIN. Here’s how the news was broadcast to police: LISTEN. 10:51PM — Street lights go out on Clark Street. Remarkably little happens before they come back on one minute later. 11:04PM — Ambulance for guy who can’t walk. 801 Addison. 11:40PM — “Sidewalk inspector” 801 Addison. Again. 11:45PM — Bottles being thrown at police. Addison & Clark. 11:49PM — Still throwing bottles at police. 11:57PM — Back at 801 Addison, another arrest. 11:59PM — The arrest van that can’t move is unloaded. Three men and one woman are moved to an operational vehicle for the ride to jail. 12:08AM — Bottles being thrown at police vehicles. Southport and Addison. 12:14AM — Order: “Eradicate the area” where the bottles are coming from. 12:18AM — One arrest for throwing bottles. 12:21AM — A man and a woman have arrived in handcuffs at the broken down arrest van. The order went out to close T-shirt sales at 12:45AM. 12:40AM — Somebody went and got themselves beat up. 3776 Clark. EMS going. 12:45AM — T-shirt vendors ordered to close. 12:52AM — Three arrested at Addison and Racine. 1:00AM — Keep the cars comin’ to Addison and Racine. 1:16AM — Commander reports that she’s been told that celebrants have broken a window at Sleep City, Clark and Fletcher. Her information is spot on. 1:19AM — “Hey, do you mind if we take an [evidence technician] away to do a quick photography job on a damaged squad car?" 1:34AM — “I dunno if he’s on drugs or highly intoxicated, but he needs to go to the hospital.” EMS rolls. 3800 block of Clark. 1:39AM — Hat trick! Three arrests at 919 Roscoe. 1:42AM — At Kenmore and Barry, a man says two black men took his phone. One is being detained, the other fled southbound in a vehicle. Witnesses note the license plate number. 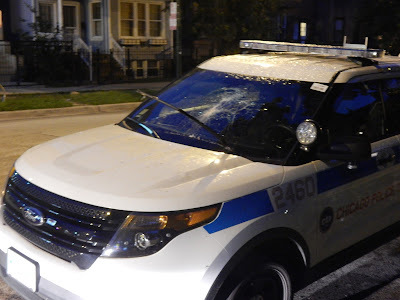 1:48AM — Cab driver beaten at 1410 Addison, officer says. Ambulance rolling. 1:49AM — “A male white stole a statue” from Southport and Iriving. 1:51AM — Another cop car damaged. 1122 Addison. 1:53AM — Robbery at Sheffield and Oakdale (scene of a recent robbery/murder and a similar robbery on Sunday morning). Man reports that two black men approached him from behind and one hit him with brass knuckles. The offenders flee in a vehicle with the same license plate number as the 1:43AM incident. Case HY302949. 2:04AM — SWAT sergeant reports that three of his unit's cars have been vandalized. 1124 Eddy. 2:09AM — Concerned citizen reports hooligans firing off a “car trunk full of fireworks” at Roscoe and Sheffield. 2:20AM — Patrick had a disagreement with his girlfriend at Clark and Belmont. Then, she tried to bite his finger off. 2:34AM — SURPRISE! It turns out that evidence technicians have been watching video feeds of the night’s festivities and they’re now matching up the footage with arrest reports. 3:14AM — Man calls police from his home in Lincoln Park to report that he got beat up and robbed of his phone in Wrigleyville tonight. 3:18AM — EMS going to Broadway and Aldine for a man down. Male. White. Wearing a Blackhawks jersey. 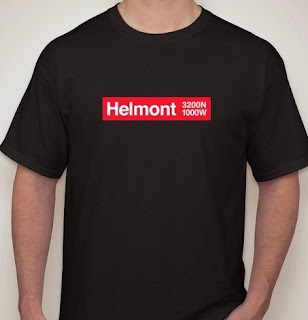 Visit our company store for "Helmont" CTA-themed shirts, advertising opportunities, and our much-appreciated Tip Jar.